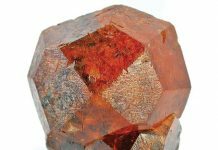 Contributor Note: This column concludes the strange beliefs and superstitions about minerals and gems that began in part one of this historical perspective. My favorite mythical story is from Gem (Smithsonian Publishing). In antiquity a quartz crystal was created by Bacchus, god of intoxication, wine and grapes. He pursued a woman named Amethyste who refused his advances and she prayed to the goddess Diana for help. So Diana transformed her into a white stone, and then Bacchus poured dark wine over the stone as an offering, dyeing it purple. 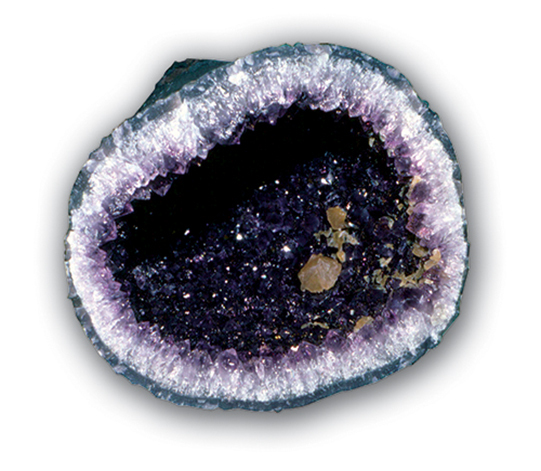 Thus, amethyst was created. If she an amethyst will wear. Emerald (beryl) was an antidote for poisons and demonic possession. The Greek author Theophrastus wrote in third century B.C. that it rested the eyes. The Arabs in 1603 used it for dysentery by placing it in the mouth or on the abdomen. It was a laxative for Hindu doctors in the 15th century. Jade was perceived in the shape of a kidney and was known as a treatment for renal problems, though has no relation to internal kidney stones. Agate ornaments were believed to cure insomnia and ensure pleasant dreams, according to George Frederick Kunz, for whom kunzite is named, in The Curious Lore of Precious Stones. An agate on the hand is worth two in the bush! These myths and many others were most popular until the early 19th century and some still persist today. The following reasons explain why these beliefs were so credible. First, the field of chemistry was unknown, scientific geology was still in the future (later 18th century) and the scientific method developed by Francis Bacon, (1561-1626) was not commonly utilized. 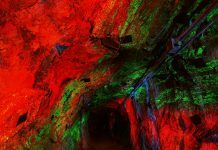 Consequently, true knowledge of rocks and minerals was extremely limited. 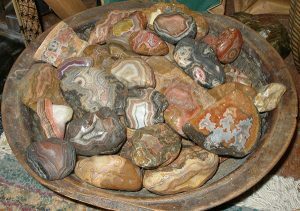 When I placed my Fairburn agates in an old, wooden bowl, I got an immediate impression of sensuality, warmth, and vibrant energy. Second, attributing unusual powers or properties to gems enhances the sellers, priests, shamans, and physicians’ reputations through the land. They hold the power through gems to protect others from harm, give them luck, cure their ailments and fulfill their wishes. When the gem fails to work, it is God’s will. Third, this is an example of the fallacy of Post Hoc, in which individuals reason that because X occurs after Y, then Y caused X to happen. If I am ill, and then carry a ruby with me, and return to good health, one might assume that the ruby made me well. In reality, I felt better because I rested in bed and slept a lot. This famous fallacy of false causation is still widespread even among educated people. Gullible individuals may be unaware that rocks have no auras or unexamined properties. Fourth, gem sellers increased the monetary value and the desire for their stones by telling buyers that stones possessed these powers. It is possible some savvy sellers invented them. If the buyer has an eye problem, then tell him or her that the gem will cure it. The metaphysical new age beliefs this writer has seen posted in rock shops are similar to these superstitions. They are purely wishful thinking, one of the oldest fallacies, and most difficult to vanquish because they fulfill human desires. Reputable dealers will not (or shouldn’t) spread or promote these beliefs.